It all starts as a meteor shower rockets across the dark galaxy. Four glowing pods sparkle and crackle while hiding behind the meteor show. A mysterious force makes the meteor shower turn a hard right towards a bright blue ball in the distance - planet Earth. In a comfortable suburban house in Michigan, Stuart Pearson (Kevin Nealon) and his wife Nina (Gillian Vigman) head a family that includes adorable seven-year-old Hannah (Ashley Boettcher); 15-year-old Tom (Carter Jenkins), a techno-geek whose grades have gone south; and big sister Bethany (Ashley Tisdale), who's just returned from a secret outing with boyfriend Ricky Dillman (Robert Hoffman). Deciding the family needs some good old-fashioned togetherness, Stuart packs up the clan and heads to a three-story holiday house in the middle of nowhere. Joining them is Uncle Nate (Andy Richter), Nate's son Jake (Austin Butler), dear old Nana Rose (Doris Roberts), and identical 12-year-old twins Art (Henri Young) and Lee (Regan Young). An unexpected arrival is Bethany's beau Ricky, who wrangles an overnight visit with the extended family. As day turns to night, dark storm clouds start swirling around the house. Suddenly, four glowing objects shoot toward the roof. The alien crew inside the objects is made up of Skip, the tough commander, Tazer, a muscle-bound dude armed to the teeth, Razor, a lethal female alien soldier; and Sparks a geeky four-armed techie, who is the only non-threatening alien intruder. Ricky is placed under the spell of the aliens, courtesy of a high-tech mind-control device and plug implanted into the base of his skull; Ricky's mind and actions now belong to the alien crew. The alien Zirkonians," via Ricky, lay claim to the planet. Like a puppet/robot/zombie, Ricky moves towards the boys - but Tom and Jake break free. It isn't long before all five kids see the strange new arrivals. 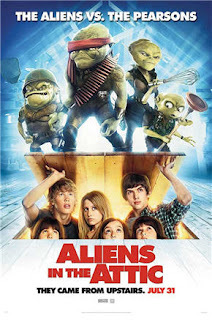 Tom takes charge and the kids come to realize the alien mind control device only works on grownups, giving them a fighting chance against the invaders - and the responsibility to protect the adults by keeping the aliens' existence a secret. Left to their own devices, the kids unleash their imaginations, creating makeshift weapons, like piping ingeniously rigged as a home made potato spud gun. They even learn to use the mind controller. First order of business: taking control of Ricky - and turning his robot/zombie/ idiot actions against himself and the aliens. The adults remain oblivious to the alien presence and figure the kids are being...kids...and insist that the youngsters partake in a fishing expedition. Meanwhile, a touching friendship is struck between Hannah and Sparks, the friendly alien with four arms and hands. Unlike his alien cohorts, Sparks has no stomach for battle; he just wants to return home to his Zirkonian family. Nana Rose comes under the spell of the alien mind control device, which gives her super-human powers. She comes to the kids' rescue -and into a battle with Ricky, who is again under alien control. Nana Rose gives Ricky a huge jolt causing the alien plug to dislodge. Skip joins the kids fight and uses his four arms relentlessly creating devices that eventually help the kids fight on.